Persistence Market Research has come up with a new exhaustive research report on the global cutting tool inserts market, which is being titled ‘Cutting Tool Inserts Market: Global Industry Analysis (2012-2016) and Forecast (2017–2025)’. This research report covers current market scenario as well as future market projections for a period of eight years, from 2017-2025. The report also consists of key drivers that are driving the market growth, restraints that are limiting the market and also the trends that are following the market. The report gives a complete overview of the global cutting tool inserts, which can help the businesses that are looking for opportunities to invest in the market. The report consists of a systematic segmentation that bifurcates the market into different parts for easy understanding and analysis of a huge market. Another important part of the market is a section dedicated to the competitive landscape of the global cutting tool inserts market. It briefs the profiles of key market players currently operating in the industry. It includes their current progress as well as the future strategies. This can be of great help to the businesses and new entrants who are striving to gain competitive advantage in the global cutting tool inserts market. This research report involves critical analysis of the market and a vast study by the industry experts and analysts. The methodology includes an in-depth secondary research which will help in determining the key players, market size, potential regional markets and several aspects influencing growth. This is followed by accumulation of data from various sources like company websites, annual reports, white papers etc. PMR also conducts expert interviews which adds a great value to the report. All the data collected in the research report undergoes a triangular method of validation in which the primary, secondary and PMR analysis contribute to the final data. The data is also scrutinized using standard tools to obtain qualitative and quantitative insights. Cutting tool inserts are mainly used for surface finishing and metal cutting operations. These inserts come in different material types and substrates. The cutting tool inserts are used in applications such as threading, milling & shearing, parting & grooving and drilling & boring. The cutting tool inserts find their place in various end use industries. This mainly includes transportation, woodworking, medical, die and mold. The process of threading done with the help of cutting tool inserts is used in industries such as automotive, construction, ship building etc. Drilling and boring is also an operation done with the help of cutting tool inserts which is used in manufacturing engine blocks. However the global cutting tool inserts market analysis suggests that transportation is the most lucrative end use segment which is expected to reach a market value of over US$ 10,500 Mn by the end of 2025, growing at a CAGR of 7.2% during the forecast period. There are also various sub segments of transportation, which includes automotive, aerospace and marine. 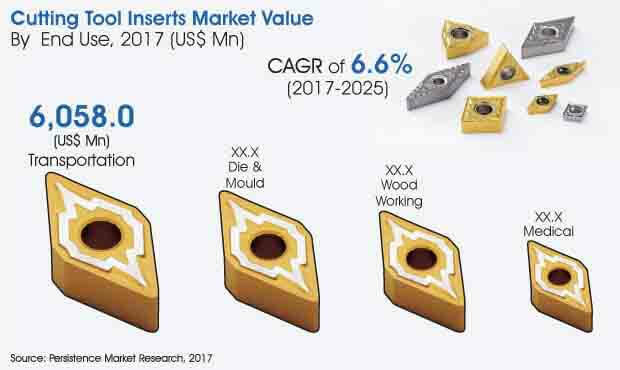 Among the sub segments, automotive is expected to contribute the most to the growth of the transportation segment by augmenting the demand for cutting tools inserts in this industry. Automotive sub segment is expected to reach a market value of over US$ 6,000 Mn by the end of 2025, growing at a value CAGR of 7.4% during the forecast period. The construction industry has been a major supporter of the cutting tool inserts market. In real value terms, the global industry is expected to have reached US$ 8.5 trillion in 2015, up from US$ 7.5 trillion in 2010. In the coming years, the pace of expansion is expected to further accelerate. In addition, many regions have also witnessed prevalence of new manufacturers, owing to industrial growth. China, and India are expected to witness strong growth driven by the country’s rapidly expanding manufacturing base and increasing investments in high-performance cutting tools. In other developing countries such as Philippines and Bangladesh, the positive scenario and policies, infrastructure, and steps, which are being taken to promote business, especially in the manufacturing sector, will have a positive impact on the cutting tool inserts market offering huge opportunities for investors. With the fundamental growth in infrastructure-related industries including energy, railway and road construction, the automobile industry is also expanding. This will drive the overall cutting tool inserts market due to their requirement in the manufacture of transmission components, engines, brake rotors, gears, bearings, and other components. On the basis of these factors, it is expected that the market for cutting tool inserts will continue to grow at a significant pace in developing countries. The Asia Pacific region is considered as a focal point of modern creation and administrations, offering a high level of global industrial exports, especially for innovative and electrical merchandise. This has made the locale an alluring area for financial investors, as firms try to exploit low costs of labor and the available technical skills. However, there is an increasing deficiency of skilled labor as skills are lagging behind economic transition to highly service facing and industrialized economies.